Gutters have a simple function. They route rainwater that’s landed on your roof away from your home. Horizontal gutters collect water from the roof, while downspouts (or rain gutters) bring water safely to ground level. Simple. And aluminum gutters are just as effective as other gutters, including copper gutters. We custom build our aluminum gutters and their connection points, ensuring that our gutters perfectly fit the envelope of your home. Our craftsmanship also ensures that your gutters don’t leak. Now, aluminum gutters don’t last forever. Unlike copper gutters (which last for 50 years or more), aluminum gutters generally last about 20 years or more. Be mindful that your aluminum gutters may begin to leak after two decades or so, and you’ll have to replace your gutters at this point. Aluminum gutters are also a bit weaker than copper gutters. If, for instance, a tree branch sweeps into your aluminum gutters during a storm, they’re more likely to be damaged if they’re built out of aluminum instead of copper. There’s a real difference in the look of aluminum gutters and copper gutters. While copper has that natural metallic color, aluminum can be painted or metallic in aesthetic. You’ll be able to select a color that works best with your home. Folks often match their gutters with their home paint, the color of their roof, or the color of their trim. You also have a few options for gutter shape. You can opt for box gutters (which are rectangular in shape) or half-round gutters (which are formed in a half-circle). 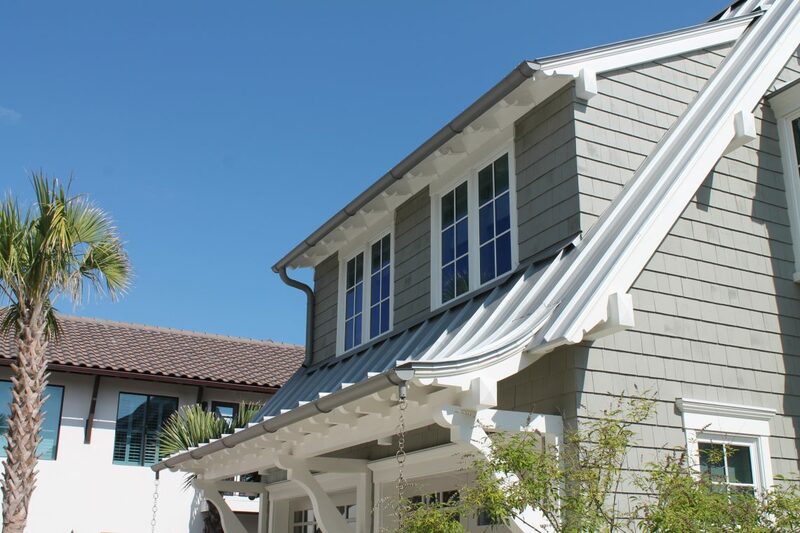 The choice is purely aesthetic, so pick a gutter shape that makes sense with your home! At the end of the day, the cost of your gutters is likely the determining factor in your material choice. We get it. You want an affordable gutter system that works. And that’s exactly what aluminum gutters provide. You’ll have to weigh this advantage against the vulnerability of aluminum gutters over copper gutters. It may be worth your while to invest in copper gutters upfront, since you may have to replace aluminum gutters twice as often. Not sure about the math on your project? Regardless of your gutter material, we’re your local, Freeport source for gutter installations. We provide gutter installation and repair services to folks throughout Walton, Okaloosa, and Bay Counties. Take a look at our gallery of completed projects, and our previous clients’ testimonials.